We aspire to create high quality, all natural soaps and salves using essential organic oils/butters and botanicals. Ingredients are derived from reputable distributors and sourced locally. Made from scratch with the cold process method using high quality food grade, virgin and organic vegetable oils/butters, essential oils, botanicals, & clays. Ol’ Darlin’ prides ourselves on only using locally grown and sourced unrefined beeswax, as well as herb infused oils in our salves and balms. 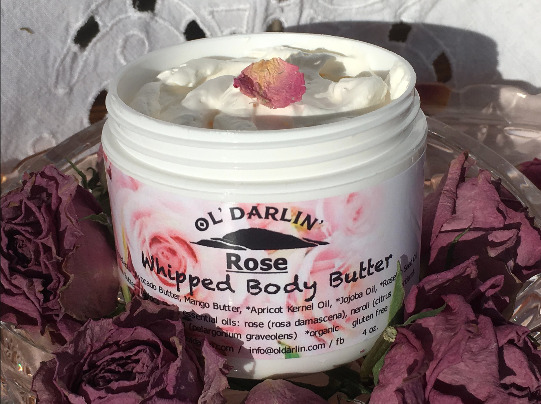 Our whipped body butters are made from all-natural butters and essential oils. Making for perfect skin with moisturizing, and calming properties.